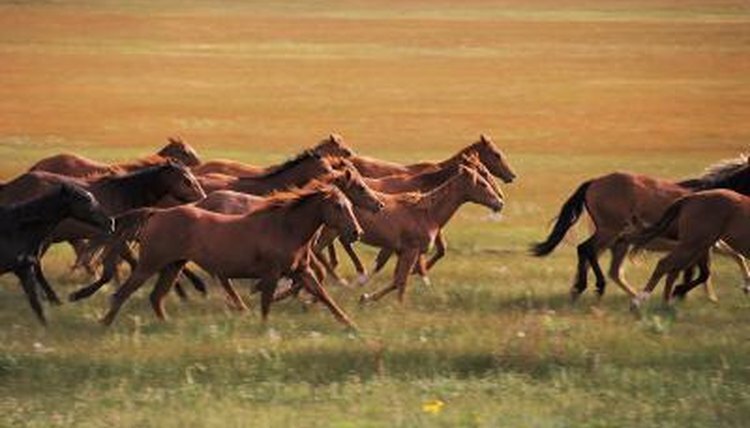 Mustangs are feral horses roaming North America. They are descended from Andalusian, Lusitano and barb horses brought by the Spanish conquistadors. Many of these horses escaped, along with ponies and draft horses brought by other European colonists. Mustangs are short, muscular and hardy horses. They are known for their strong constitution and intelligent disposition. The mustang most closely resembles a small Warmblood-type horse and stands between 13 hands and 15 hands high. Hands are measured from the ground to the horse's withers, each hand 4 inches. The mustang's body is muscular, with a well-defined and narrow chest. Mustangs tend to have short backs and rounded hindquarters. Mustangs display a well-shaped head with intelligent, wide spaced eyes. Most Mustangs have brown eyes, although if they have bald face markings, the eyes may be blue. Spanish Mustangs have also been noted with grey and green eyes. The eyes can have slanted or almond shapes. Mustangs have especially sturdy and strong legs and hooves. These developed over years of roaming harsh, rocky terrain in the western portion of the United States. Some Mustangs develop light leg feathering or hair growing from the back legs. This hair develops in the winter but usually sheds out in the summer. The hooves tend to be round with thick walls. Mustangs can be any color, and color and coat patterns can be striking. Solid colors include bay, black, chestnut, gray and brown and palomino. Both overo and tobiano pinto patterns exist, as well as Appaloosa or spotted patterns. Cremello, buckskin, dun and roans are represented.